Thanksgiving is my favorite holiday. There’s no present wrapping or gift giving around this day, no wish lists other than time with family and friends, it’s simply a day for food, and gratitude. It is my strong belief that every American deserves time with their loved ones on Thanksgiving and consumerism should not trump this very simple pursuit of happiness. 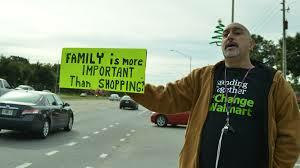 I’m not the only one who feels this way, all across the country retail workers from Kmart to Walmart have had enough, they are tired of having to choose between their families and their jobs. They are tired of having their holiday cut short or in some cases being denied the holiday all together, in order to supply consumers with discounted televisions and blenders. This materialism, this idea that your need to shop trumps their need for family time, is quite possibly the most selfish thing I’ve seen in recent years. I think Lewis Black sums it up quite nicely in a segment he did for The Daily Show recently….”you don’t have to shop” and he’s right, you don’t have to participate in the madness. You have a choice as consumers to support your neighbors, friends, and family during the Thanksgiving holiday by restraining from shopping on Thanksgiving or Black Friday. Thanksgiving, this wholly American holiday, is the one rare time in our country when we collectively celebrate, appreciate and show gratitude for the simple blessings we share in life. So why can’t we appreciate the very real need for retail workers to want that day off as well? Why can’t we see how unfair it is for parents to be pulled away from their kids or kids to be pulled away from their parents on Thanksgiving in order to prepare for the onslaught of consumerism? The images of people, literally, being trampled to get their hands on products is a disturbing one. Just do a search of “black Friday mobs” and you will find image after image and story after story of people being pushed, trampled, injured and in some cases killed just to be the first person to catch a holiday sale. Last year was labelled a “calm” Black Friday, seeing only 1 death and 15 injuries. Please, let that sink in for a minute, dear readers…that even one person should die while shopping…it disturbs me…does that disturb you? If so, then I beg that you boycott this ridiculous, corporate created, tradition that contradicts every single thing Thanksgiving represents. Refrain from shopping, stay close to your loved ones for one extra day, hold them close, and let other Americans do the same. Let corporations know, with your dollars, that it is unacceptable to pressure or coerce employees into working on a day intended to give thanks to the simple things in life. We have the power to take back the holiday and prevent it from being marred in materialism. There will always be sales and plenty of opportunities to save this holiday season. 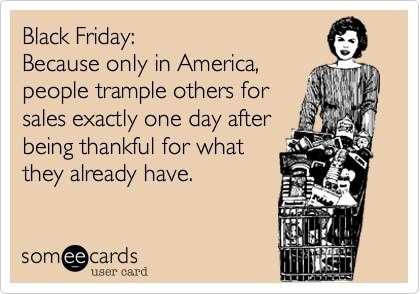 Retailers will always provide discounts to their consumers whether you show up on Black Friday or not. Perhaps, instead you can participate in cyber-Monday, from the comfort of your own home. The benefits include relief from endless lines and no danger of being trampled by ruthless mobs. You will also have your packages conveniently delivered right to your front door.